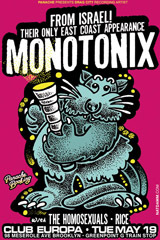 Monotonix Return to Brooklyn. Only East Coast appearance! Tel Aviv’s MONOTONIX return to Brooklyn to play Club Europa. This will be their only US East Coast Appearance. The Homosexuals and Rice also share the bill. The band will be debuting new songs that they’ve been working on in New Orleans this past spring. After their NY jaunt, they will make their way to Canada and then the state of Washington for their performance at Sasquatch Festival.